Amma of Me by Amma Gyan is sharing a homemade decor item made from material from a scrap store. If you're a regular reader, you'll know this is right up my street. I’m a Leo and very much a Leo. I’m a doer, a believer in God and all things spiritual. I love to make and create and think it’s amazing to have an idea make it real, share it and experience the joy that someone else receives from it. Finally I’m Ghanaian born Londoner, mum of two, wife of Irish farmers son, kind of living the dream and grateful for every moment. What a great introduction Amma. What about the handmade item you are sharing with us? Lemoncello asymetric pouffe. So it’s a Saturday morning and I’ve hit the scrap store. I’d got there early as they‘re only open for a couple of hours and the good stuff flies out. As usual I head straight into the brightly coloured patterned section and came across lilac grey and yellow fabric which I loved. 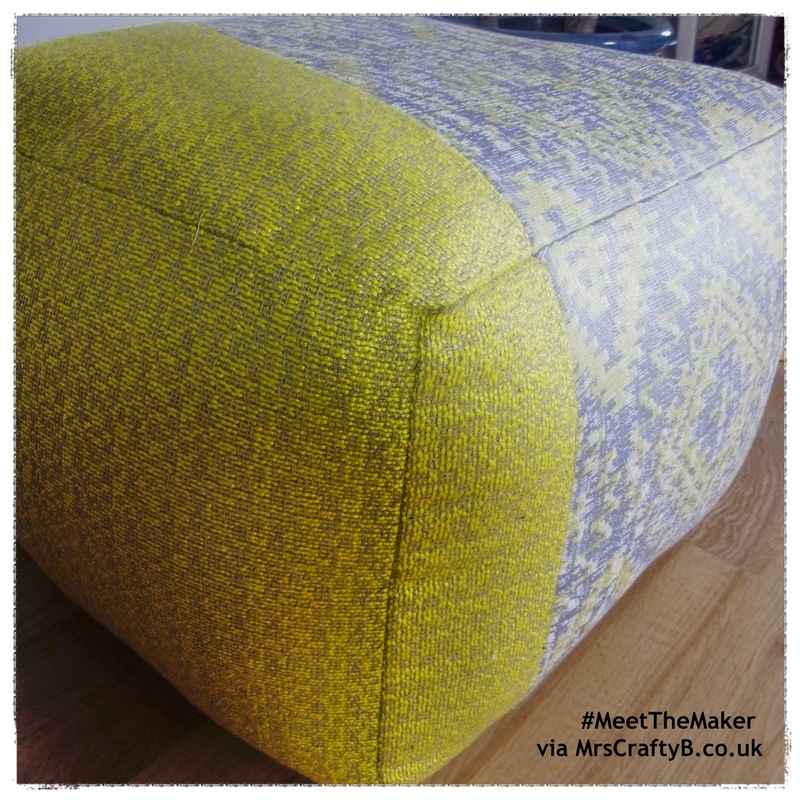 Just as I was thinking what should I team this up with, another customer pulled out the textured yellow fabric, gave it the once over then put it back – I grabbed it, it was just what I needed and just enough. You never know what you‘re going to find at the scrap store which is really exciting -everything I make is has been selected by chance. Unlike most of my pouffe designs I decided not to finish this one with my signature sticthing – I didn’t think it needed it. I love the end result and so did that one lucky customer. It's great. I love the fabrics. Isn't it amazing what you can find at scrap stores and what fab items you can make with them? How did you learn to make items like this? I made my first pouffe, almost two years ago to date. I saw one on pinterest, loved it so decided to make one. Coming from a pattern making background it was easy to figure out how to do this. I started with my Moroccan inspired shape then went on to design my own pattern from scratch. The hardest part of making the pouffe is stuffing it. Second to the stitching it’s the most time consuming part of the process. Figuring out how to stuff it and what with was another challenge that was achieved with time and error. When and why did you decide to turn your creative skills into a business? I’ve always wanted to do what I’m doing as a child, so I feel very lucky. Ultimately I made the decision to set up my own businesses because after finishing my degree in Multimedia and Information Systems I realized that it wasn’t what I wanted to do however time wasn’t on my side (so I thought, I was only 23 at the time). So I decided I couldn’t compete with the flow of people coming out of Central St Martins, so I would have to set up on my own and try to build credibility over time. I registered the business in 2003 and have been figuring it out ever since. Colour, texture and my desire for it. So is this year your first at the Handmade Fair? Yes this is my first year at The Handmade Fair and I’m very excited because I think it suits my product and brand well. Showing off! Hahaha. Showing people my stuff, hopefully meeting lots of new customers, possibly getting a glimpse of Kirsty. But in all honesty just getting out there and sharing my wares in what I hope will be a lovely atmosphere and environment. What will visitors find at your stand? I’ll be selling my pouffes, leather accessories, macramé wall art and my ever popular moulded leather Masai earrings. I have a few freebies for pouffe orders made on the day and for everyone that purchases from me who you mention you. Is that another Crafty Bs special?! I think so! Thanks so much Amma. So where will we find you? Stock stock stock! Making constantly to keep on track. It’s what has to be done to be ready whilst working round two children. I’ll be working on some new items especially for the show as well. Such hard work being self employed with children. Fab job and I hope the fair is everything you want it to be. Quick fire round then. Not sure yet but I’m a sucker for supplies so a haberdahsery I‘m sure. My moulded leather earrings – I wear them everyday. Where ever my friends and family are. Lemon flovoured drinks, particularly fresh still lemonade. My children, sharing and selling and love. Hanging in there and still doing what I’m doing. And designing for Jigsaw. Amma thanks so much for taking part in Meet The Maker and I will pop by to visit you at the fair!